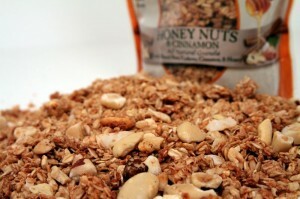 Another granola review from the New England Naturals line! 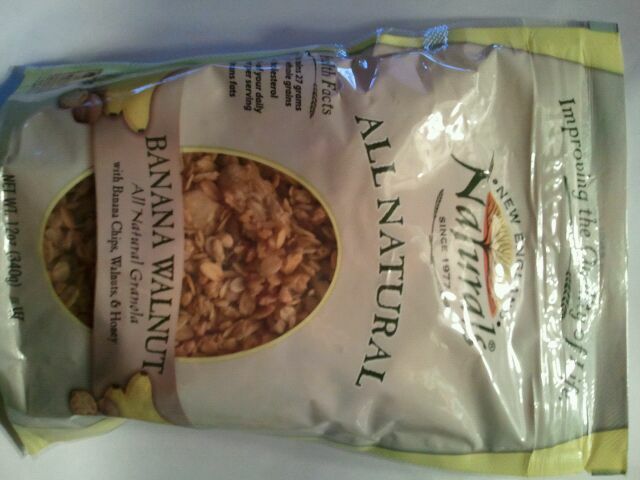 Last time I tried the Banana Walnut and thought it was pretty good. 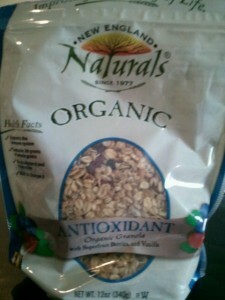 Now today is the New England Naturals Organic Antioxidant Granola with Superfruit Berries and Vanilla. So this one, according to the package, has “36 grams of whole grains”, and is “rich in Omega-3”.Now, to be fair, I believe somebody got a hold of this bag of granola before I got to try it, so half the bag was gone (I have some hungry people living in my house apparently!!). So I thought well, if half the bag is gone, this HAS to be good! I opened it up and saw mostly oats, with some pieces of dried fruit and an occasional sunflower seed/ walnut piece, which were crunchy and fresh tasting. Anyway- the granola itself had a good crunch and had a mild sweetness. It had a vanilla flavor and a bit of cinnamon as well. 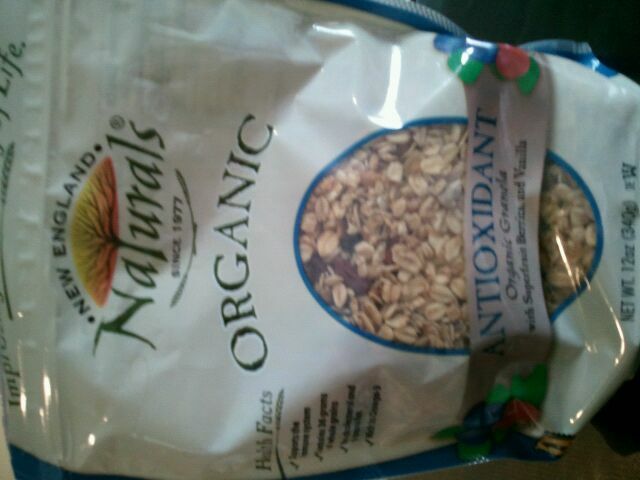 I imagine this being a great granola for putting on yogurt! There also were plump and sweet raisins, and red bits of dried fruit as well. I thought they were all cranberries. And although there were some cranberries, they were NOT all cranberries. I did NOT like the other orangey/red pieces- I looked at the ingredients and found out they were goji berries. I have tried goji berries before in other products and thought they were ok, but these had a horrible aftertaste. Bitter, and just NOT my kind of berry. I was glad the sweet raisins were there- I think they came to the rescue! However, all together- quite tasty! 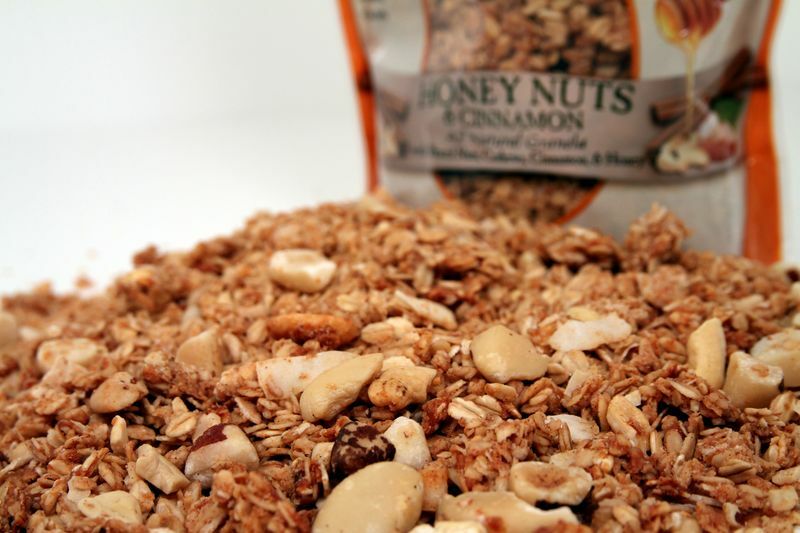 I loved the consistency of the granola, and the overall flavor, minus the goji berries, was quite good. A serving of 1/2 cup has 4 grams of fiber and only 6 grams of fat, so that’s pretty good in my eyes. I also love that it’s organic, of course! 3 1/2 stars. 1 serving ( 1/2 cup) is 230 calories, 6 grams of fat, 37 grams of carbohydrates, 4 grams of fiber, 10 grams of sugar and 6 grams of protein. Are you a fan of Goji Berries? 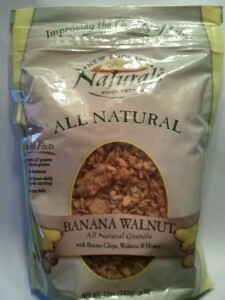 I received this granola to try for free from New England Naturals. When it comes to snacks, I have to be in the mood for a granola bar. Most of the time I find I would prefer something crunchy or something I can sit and savor rather than a granola bar, which I view as a more on-the-go type of snack. However, the other day I wanted something substantial, and something tasty. 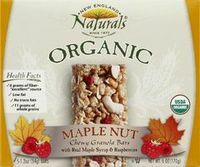 I pulled out the New England Naturals Organic Maple Nut Chewy Granola Bar, in hopes it would taste as good as the last one I tried. Some things to note, the wrapper states that this bar has “6 grams of fiber”, “11 grams of whole grains” and is “low fat” with “No trans fats”. It already was my type of granola bar. I opened up the wrapper and saw a decently sized ( 34 grams) bar, that was flexible and easy to bend. I was excited. This bar had maple in it, one of my favorite things. I took a bite and it certainly had a chewy and dense texture, and sort of a disappointing maple flavor. It was sweet, just a tinge salty, and had sort of an awkward maple flavor. Not to say that I didn’t like it, but I didn’t love it either. I did appreciate the density of the bar as I chewed it, not too thick/dense, but just the right amount. 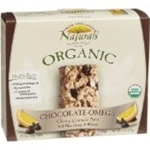 Overall, I do like that it was organic, had some whole grains and had 6 grams of fiber per bar. I can see it being a good snack to hold me over until my next meal, and perhaps a good lunch with some fruit and a yogurt. I do wish it had a better maple flavor, as that’s what I was hoping for in this bar. So, this one gets 3 stars. 1 bar (34 grams) is 120 calories, 2 grams of fat, 27 grams of carbohydrates, 6 grams of fiber, 8 grams of sugar and 2 grams of protein. What’s your snack of choice? Granola bar, or something else? I was sent this granola bar to try for free from New England Naturals. New England Naturals is a new company for me. But after doing some research on their website, I discovered it truly is a great company. Not only do they make all of their products kosher and organic using on the finest ingredients, they also donate 10% of their profits to organizations that also do business in an environmentally and socially responsible way. The bar was about the size of a Quaker Chewy Bar, maybe a little bit bigger, and had an oaty appearance with chocolate chips dispersed throughout. It was soft and chewy, and fell apart easily. Seeing as the second ingredient was brown rice syrup, I would imagine why it had a little bit of give to it. Upon the first bite I tasted orange zest. Weird? Maybe. But I liked it. Ever have one of those “chocolate oranges” that you have to unwrap and then hit on the table for the “pieces” to come apart? And then you ate a “chocolate orange wedge”? I HOPE someone knows what I’m talking about so I don’t sound crazy- but pretty much that’s what it reminded me of. A unique flavor combination of orange and chocolate. I would have preferred a bit more chocolatey flavor, including chocolate was in the name, but it was still pretty good. It was nice and sweet, too. Overall, 4 stars. The nutritional stats are actually quite good, and the taste is unique and worth giving a shot. Each bar provides 410 mg of Omega-3s, has antioxidants, and provides at least 11 grams of whole grains. I like that there is flax meal, walnuts and hemp seed in this bar as well. Health benefits!! It loses some points because it’s not that filling on it’s own, but I do think it’s a good light snack paired with a glass of milk or some fruit. There is also naturally milled sugar listed in the ingredients. The bars also come in two other flavors, Maple Nut and Antioxidant Bar. 1 bar is 140 calories, 4 grams of fat, 25 carbohydrates, 2 grams of fiber, 11 grams of sugar, and 3 grams of protein. Organic whole rolled oats, organic rice syrup, organic crisp brown rice with organic rice syrup, organic tapioca syrup, organic naturally milled sugar, organic chocolate chips (organic sugar, organic chocolate liquor, organic cocoa butter, organic soy lecithin, organic vanilla), organic apricots with organic rice flour, organic flax meal, organic walnuts, organic hemp seed, organic soy fiber, organic expeller pressed canola oil, organic orange flavor.